so this is the second blog of the two that you can expect from me at the end of every month and it includes Michael's overall numbers for the 2018 campaign so far. this specific post covers March 29 through May 31. if you're not that concerned with stats per month and just want to know Michael's total numbers to this point in the year without all the extra detailed information that i provide in my monthlies, then this is the blog for you. Michael's .337 batting average is currently the highest on the team out of all the qualifying players. Francisco Lindor is the closest behind him, batting .311.
through May, Michael leads the team with 40 singles, 2 grand slams, and a .337 batting average. he's tied for the team lead with 1 triple and 2 sac flies. also, among qualifying players, he has the least strikeouts with 18. Michael is 2nd on the team with 36 RBI and a .383 OBP. in addition, he's 3rd with 62 hits, 22 extra base hits, 31 runs, 103 total bases, .560 SLG, and .943 OPS. he leads the outfielders with 362.1 innings and 41 games played. he's tied for 1st with 1 double play, tied for 2nd with 58 putouts, and tied for 3rd with 1 assist as well. whilst looking through my personal documentation of Michael's numbers, i saw that he set career highs for himself through May with 2 grand slams, a .337 batting average, .383 OBP, .560 SLG, and .943 OPS. Michael has 9 home runs in 2018 so far, which is very good for someone who isn't known as a power hitter. but, like i always say, he's never needed to be a big home run hitter in order to be productive. alas, that is also why he gets overlooked by many and will forever be one of the most underrated players in baseball despite his other plentiful statistics.😞 the team leader in home runs right now is Jose Ramirez with 18. who saw that coming? Francisco Lindor is 2nd with 14, Edwin Encarnacion has 13, and Yonder Alonso has 11. Michael's nine rank 5th. two months into the campaign, Michael has 36 RBI versus 68 men left on base. considering he was getting moved around in the lineup between 4th, 5th, and most recently 2nd, i'm content with this. i thought he'd need an adjustment period and therefore have some difficulty driving guys in. i additionally wasn't sure if there'd even be that many guys on base for him when he started batting 2nd, but so far all has gone well. 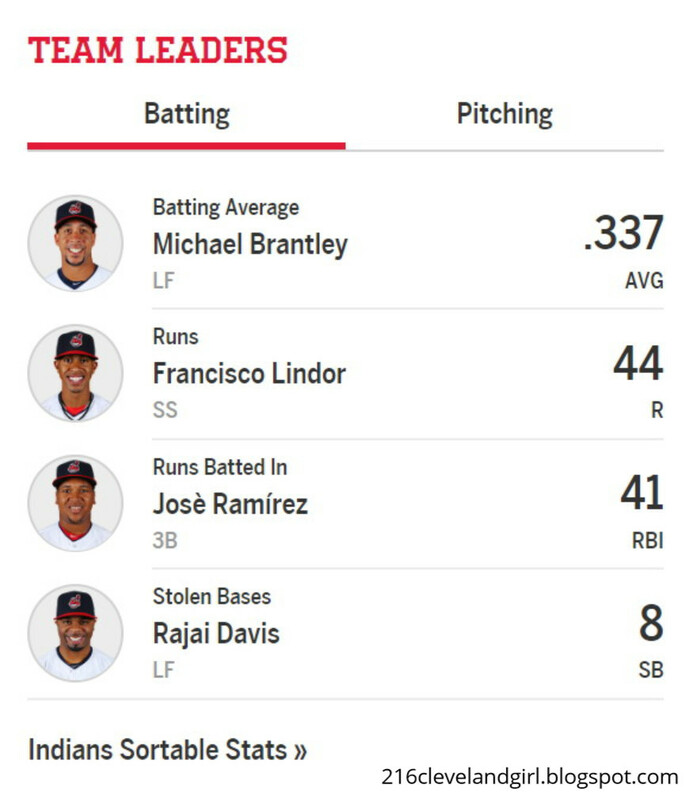 Michael's 36 RBI are 2nd most on the team, while Ramirez is 1st with 41. Lindor and Encarnacion are tied for 3rd with 34 ribbies and Alonso has 33.
here's the updated HR:RBI ratio. six of Michael's 9 home runs were solo, one was a 2-run bomb, and two were grand slams. therefore, 16.7% of his 36 RBI have come from his solo homers, while 44.4% of his 36 RBI have come from all 9 of his home runs. Michael's K rate so far in 2018 is 9.0% (18 K/201 PA). he currently averages 1 strikeout for every 11.2 plate appearances. he's back to being one of the toughest hitters to strike out in all of baseball, so i'm very happy with this. through May, Michael has 57 groundouts, 24 flyouts, 18 lineouts, and 5 pop outs versus 18 strikeouts. this is pretty normal, with him having more ground ball outs than any other type of out and over twice the amount of fly ball outs. i'm still trying to push for him to get more balls in the air in hopes that they'll fall in for hits, so we'll see how that goes as the season progresses. Michael has reached base a total of 80 times in 2018 via hits, walks, hit by pitches, fielder's choices, and forceouts. he's scored 31 runs total, 9 of which came from his own home runs. he's been driven in 22 times by other players and left stranded 43 times. (he was lifted for a pinch runner three times, caught stealing two times, and caught in a rundown once, so i had to subtract six from the total count here.) the guys batting behind Michael did a much better job of driving him home in May than they did in the first month of the year. Michael hit in 37 of the 45 games he's played in so far in 2018 and reached base safely in 41 games. he has 8 hitless games, but still reached base in 4 of those. Michael has 18 multi-hit games, 6 three+ hit games, and 9 multi-RBI games. he has at least 1 RBI in 22 games. in addition, he has 8 go-ahead hits and 9 go-ahead RBI. the Indians are now 27-18 in games that Michael's played in and 3-7 in the games he's missed/sat out. --a still active 14-game hitting streak at home between May 1-30. it spans over May 1-3 (including a doubleheader on May 3), May 11-13, and May 24-30. --a still active 14-game on-base streak at home between May 1-30 as well. --a still active 21-game on-base streak between May 8-31. it spans over May 8-9, May 11-16, May 18-20, and May 22-31. --a still active 11-game on-base streak on the road between May 8-31. it spans over May 8-9, May 14-16, May 18-20, May 22-23, and May 31. Michael is currently batting .355 (43-for-121) against right-handed pitchers and .302 (19-for-63) against left-handed pitchers. anything at or above .300 is exceptional, especially when facing southpaws. Michael's hitting .375 (39-for-104) with 28 RBI at home. he has 8 doubles, 1 triple, and 6 home runs (15 extra base hits) at Progressive Field, along with 2 sac flies, 21 runs, 5 walks, 2 hit by pitches, 2 stolen bases (2nd), 3 GIDP, 8 strikeouts (4 swinging, 4 looking), and 67 total bases while playing 26 out of 29 total home games. he reached base on 2 fielder's choices and 1 forceout as well. he hit safely in 23 of the 26 home games he's played in and safely reached base in 24 of them. he has 3 hitless games at home, reaching base in 1. he has at least 1 RBI in 15 home games. Michael's hitting .288 (23-for-80) with 8 RBI away from Progressive Field. he had a rough time on the road in May and so his overall BA dropped nearly 60 points from the end of April. he has 4 doubles and 3 home runs (7 extra base hits) on the road, along with 10 runs, 8 walks, 2 caught stealing (2nd), 3 GIDP, 10 strikeouts (9 swinging, 1 looking), and 36 total bases while playing 19 out of 26 total road games. he hit safely in 14 of the 19 road games he's played in and safely reached base in 17 of them. he has 5 hitless games away from home, reaching base in 3. he has at least 1 RBI in 7 road games. Michael's now batting .308 (16-for-52) with runners in scoring position with 27 RBI through May. to be more specific, he's batting .556 (5-for-9) with RISP and 0 outs, .316 (6-for-19) with RISP and 1 out, and .208 (5-for-24) with RISP and 2 outs. while that last average doesn't look good, he actually improved by almost 100 points from the end of last month thanks to a semi-decent May performance. baby steps. with 2 outs in an inning, Michael is presently batting .317 (19-for-60). he now has 3 doubles, 1 triple, 3 home runs, 13 RBI, 4 walks, 1 hit by pitch, and 5 strikeouts (4 swinging, 1 looking). additionally, he's hitting .349 (29-for-83) with 30 RBI with runners on base and .800 (4-for-5) with 12 RBI with the bases loaded so far this season. he continues to be clutch when batting with ducks on the pond. lastly, Michael's hitting .327 (33-for-101) with the bases empty right now. he has 7 doubles, 1 triple, 6 home runs, 6 RBI, 6 walks, 2 hit by pitches, and 12 strikeouts (8 swinging, 4 looking). vs. the Detroit Tigers, Michael's batting .375 (9-for-24) in 6 of 7 games--3 of the 4 at home and 3 on the road. (he had 1 scheduled day off during one March/April home series.) the Indians are 4-2 in the games he's played in and won the game he did not play in. overall, Michael has 7 singles and 2 extra base hits, including 1 double and 1 home run, as well as 3 RBI, 4 runs, 2 walks, 1 hit by pitch, 1 stolen base (2nd), 1 first at bat hit, and 13 total bases. he's also reached base on 1 fielder's choice, has 1 strikeout swinging, and left 7 men on base. furthermore, he has a .444 OBP, .542 SLG, and .986 OPS. in left field, Michael's recorded 3 putouts while playing 40 innings, but only 3 complete games. 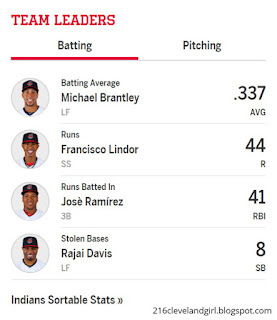 he was lifted for a pinch runner in the bottom of the 6th inning in 1 game in March/April because the Indians were winning a blowout and Terry Francona wanted to give him some extra rest, and he was lifted for a pinch runner in the top of the 9th inning in 1 game in May because the Indians were winning. he was the DH for 1 game. vs. the Chicago White Sox, Michael's batting .455 (5-for-11) in 3 home games. the Indians are 3-0 in the games he's played in. overall, Michael has 4 singles and 1 extra base hit--a home run, as well as 2 RBI, 5 runs, 1 walk, 1 hit by pitch, 3 first at bat hits, and 8 total bases. he's also grounded into 2 double plays and left 7 men on base. furthermore, he has a .538 OBP, .727 SLG, and 1.266 OPS. in left field, Michael's recorded 5 putouts while playing 23 innings, but only 2 complete games. he was subbed out defensively after 5 innings in 1 game in May because the Indians were winning. vs. the Minnesota Twins, Michael's batting .333 (5-for-15) in 3 road games. the Indians are 2-1 in the games he's played in. overall, Michael has 3 singles and 2 extra base hits, including 1 double and 1 home run, as well as 2 RBI, 2 runs, 2 walks, 1 first at bat hit, and 9 total bases. he's also grounded into 1 double play, has 2 strikeouts swinging, and left 7 men on base. furthermore, he has a .412 OBP, .600 SLG, and 1.012 OPS. in left field, Michael's recorded 7 putouts while playing 32 innings, but only 2 complete games. he was subbed out defensively after 8 innings in 1 game in March/April because the Indians were winning and Michael had done more than enough in the game. the Indians have played a total of six games against two National League teams through May. Michael has played in five of those games. the Indians are 4-1 in the games he's played in and lost the game he did not play in. overall, Michael's batting .316 (6-for-19) in Interleague Play so far in 2018. Michael is back to being a qualifying player now so not only do all of his stats qualify in the rankings, but he has several within the Top 10 when compared to other qualifiers in the American League and MLB (per mlb.mlb.com/stats). among qualifying left fielders in the American League, Michael's ranked 1st in batting average (.337) and OBP (.383); 2nd in singles (40), SLG (.560), and OPS (.943); 4th in hits (62), RBI (36), and total bases (103); tied for 5th in doubles (12), home runs (9), and sac flies (2); tied for 6th in extra base hits (22); 7th in runs (31); tied for 7th in triples (1); 9th in at bats (184); tied for 9th in hit by pitches (2); and 10th in plate appearances (201). Michael's also ranked 15th out of 15 players in strikeouts (18), making him the hardest AL LF to strike out right now. among qualifying outfielders in the American League, Michael is 2nd in batting average; 4th in OBP; tied for 4th in singles; 5th in SLG and OPS; 8th in hits; tied for 8th in RBI; and tied for 9th in sac flies. besides that, out of 34 players, he's 34th in strikeouts, meaning he's the toughest outfielder to strike out in the American League. among qualifying players in the American League, Michael ranks 4th in batting average; 8th in SLG and OPS; 9th in OBP; and tied for 10th in singles. in addition, he ranks tied for 87th in strikeouts out of 88 players, so he's currently one of the 2nd hardest AL players to K.
among all qualifying left fielders in the Major Leagues, Michael is 1st in OBP; 2nd in batting average, SLG, and OPS; 4th in singles, RBI, and total bases; tied for 4th in hits; tied for 7th in extra base hits, home runs, and sac flies; 8th in runs; tied for 8th in doubles; and tied for 10th in triples. he's also 26th of 26 players in strikeouts. among all qualifying outfielders in the Major Leagues, Michael ranks 3rd in batting average; 5th in SLG and OPS; 6th in OBP; tied for 9th in hits; and tied for 10th in singles and RBI. he additionally ranks 65th out of 65 players in strikeouts. among all qualifying players in the Major Leagues, Michael is 6th in batting average. aside from that, his strikeouts are tied for 161st out of 162 players, making him tied for the 2nd hardest player to strike out in all of Major League Baseball. in two months of play, Michael has recorded 58 putouts and acquired 1 assist in 59 total chances to yield a perfect 1.000 fielding percentage. he also has 1 double play through May. coming into May, Michael played 53 straight games in the outfield without committing an error. add that to the 24 games from May when he appeared in the OF and he currently owns a 77-game errorless streak. that's pretty good, but he's a long way from reaching the franchise record of 247 consecutive games without an error that he set in 2014.
now let's take a quick look at where some of Michael's defensive stats rank around the league. among AL left fielders, Michael's 1 assist in 2018 ranks tied for 14th with 11 other players. Baltimore Oriole Trey Mancini has the most assists right now with 6. in addition, Michael's 1 double play ranks tied for 1st with 8 other players. among all MLB left fielders, Michael's 1 assist ranks tied for 23rd (with 27 other players). Michael's 1 assist is too low to rank among all AL outfielders and among all MLB outfielders at this time. the current MLB OF assist leader is Kole Calhoun of the Los Angeles Angels with 7.
now let's break down the numbers. i am going to document his 2018 # through May, the 2nd spot #s, the 4th spot #s, the 5th spot #s, the 6th spot #s, the PH #s, and the DH #s, as well as the left field #s, BOP + left field #s, and overall outfield #s.
Michael played in 45 (of 55) games, 36 complete, in 2018 through May. he started and played left field in 41 games, completing 33 of those games, appearing in 41 total. he was lifted for a PR in 3 games after playing a total of 21 innings; 1 game in the bottom of the 6th inning because the Indians were winning a blowout, 1 game in the bottom of the 7th inning because the Indians were winning a blowout, and 1 game in the top of the 9th inning because the Indians were winning. he was subbed out defensively in 5 games after playing a total of 37 innings; 4 games after playing a total of 29 innings (8 innings/8 innings/8 innings/5 innings per game) because the Indians were winning and he had done more than enough in the game, and 1 game after 8 innings because the Indians were losing. Michael played in 36 complete games. feel free to leave any thoughts you have on Michael's season so far in a comment below!